I know, I know. There are repeating themes in my knitting life. Socks and slippers. Credit where it is due, these are knit from a new-to-me pattern, the Trim Clogs by Katie Starzman. More or less… since, with no provocation at all, I ignored her yarn suggestions, substituted an Australian alpaca yarn in a different gauge to the one she proposes, held it double instead of single, and changed the needle size. I also knit 5 instead of the required 4 since I had a monumental pattern reading failure. Needless to say, I cursed the pattern a lot and could not understand what the problem was. 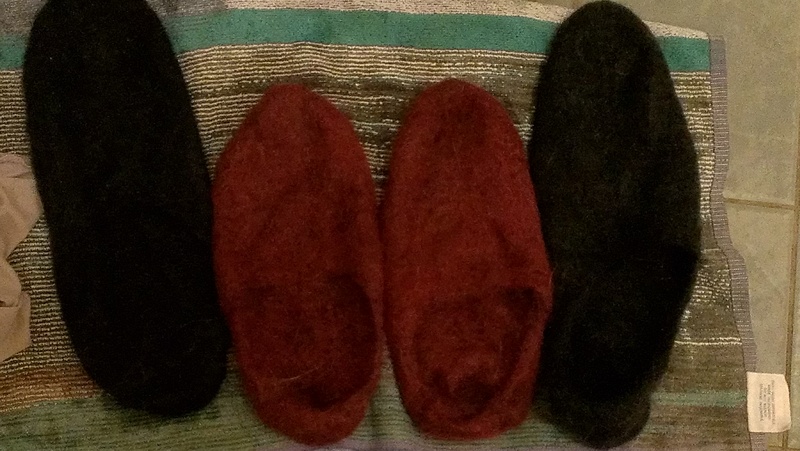 The short version is that I failed to grasp that two named sizes were being knit in the same identical manner, until I had managed to knit an entire slipper. Once I’d worked it out, it was obvious. The penny dropped eventually and I think these are rather lovely. 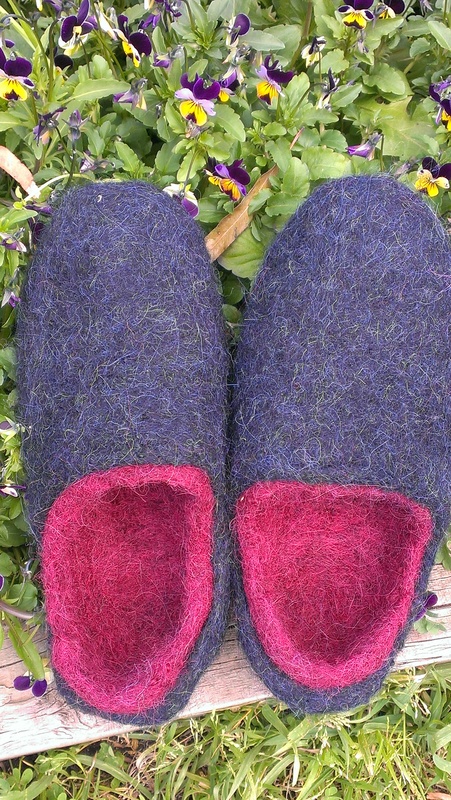 I also had a colossal felting surprise–the kind of thing you know can happen, but that I nevertheless did not expect. These slippers all came out of the washing machine one chilly night after the same amount of time in the machine, together. They started out the same size and were knit in different colourways of the same yarn. What’s with that? different dyes I think leave the scaliness of the fibres in different states .. I have found this when I did some machine felting of hand knit cardigans – most unreliable, and I stopped doing it commercially very quickly! Ah, so that’s the explanation. I had thought perhaps it was just that different fibres with different felting capacities come through a commercial mill all the time, but of course the dyeing must be a factor too. I certainly have had very different outcomes felting undyed handspun alpaca, but then there are so many variables! Oh, they look so scrumptiously warm, I think those double layers would please even my icicles toes. 🙂 I have cold toes too–though I live in a warmer climate at least! The double layer is super warm, made very thick by my choice to double the yarn. They’re beautiful. I love that combination of colours. Thanks so Much! That’s really kind of you.